Went to a boot sale at Witton Albion this morning. 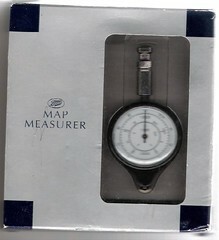 The only thing either of us got was this fine specimen of a map measurer in its box for 50 pence. Thats the POINTER, DIAL and TRACING WHEEL. - Set the pointer to 0 by turning the wheel so that the pointer "counts down" and passes 0. Now bring the pointer forward to 0. This will take up any slack in the gears. - To give greater control when using the measurer, hold the measurer on the knurled surface between the thumb abd middle finger, placing the index finger on the top of the handle. 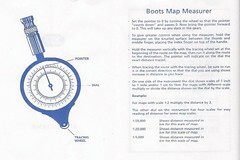 - Hold measurer vertically with the tacing wheel set at the beginning of the route on the map, then run it along the route to the destination. 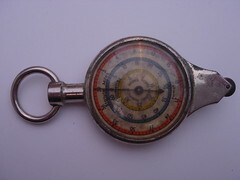 the pointer will indicate on the dial the exact distance traced." 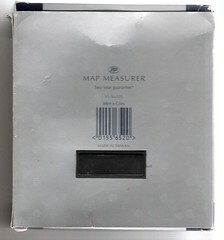 I found this small pocket map measurer on Weaverham boot sale two weeks ago. 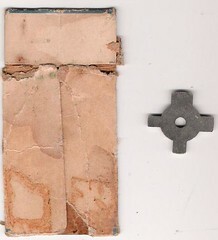 (£3.50). It feels like it should be worn on a chain and kept in ones waistcoat pocket. 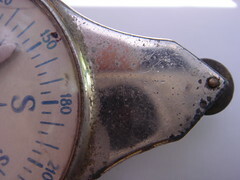 I nearly called it a pocket measurer then..perhaps thats my next project...pocket capacity. 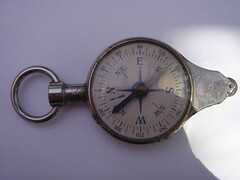 The other side is a compass. When opened out its a handy knife, which feels a little dangerous and uncomfortable to use. Itt was quite tricky to push the razor into place too. I am not surprised these are rare! 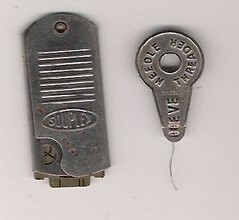 Two objects found in the same sewing box on a stall at Hartford bootsale (50 pence the two). 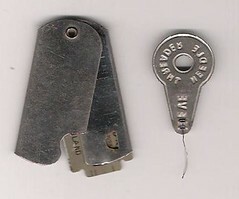 The Razor blade holder has "Souplex" stamped on it. stamped in very small letters..
A small crochet hook and its metal case. I found this on the Crewe Wednesday market a few weeks ago, but it had gone to the bottom of my bag and I forgot all about it. Its a very satidying metal object...functional, neat, stylish, simple. 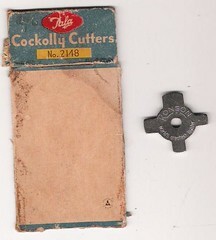 The back..shows how crude it is made...just bent tin. Although the end of it is well shaped.